Yea, that's pretty good idea. It's making upgrades visible as upgrades rather then just replacements and as we mentioned earlier they all must fit the colour pattern, surroundings, other objects, environment theme, etc. The idea Mello described above makes its implementation even easier. So dirt gives 60% speed. Wooden road gives 80% speed. Rock road and rooms gives 100% speed. Paved road gives 120% speed. Here are the walls he have drawn as textures that is. Reading those and looking at last screen i wonder do we really need roads as separate thing? (new roads looks nice btw, however i'd make planks a bit broader - 2x maybe). If there are already few tiers of roads, and same is planned for walls, assuming both will have same ammount of tiers... why the road and the wall shouldn't be considered the same? It was the same recently at least. Once tile was claimed it became reinforced wall looking from side, and paved floor when walked on. Most of discussion here end up on dungeon appearance, and how does road and wall match or not to each other. With the system of step by step upgrades - wood, cobble/rock, stone, iron reinforced it should be rather easy. I player decides where does roads (or just floor) improvement goes it would actually be the same for walls. 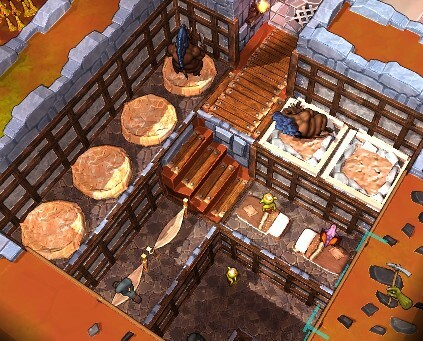 At the end player would be able to crate dungeon sectors with visually matching elements and keep the way how wall and floor function (plust tier upgrades benefits). One note to that about consistency - If there is for example fully reinforced wall standing ontop of dirt block it would be nice to see that nice polished stones blend with earth and vanish at the bottom of the block. Simple gradient mask would do texture blending good enough. This way you'd get rid of eye pinching difference between reinforced and dirt blocks which look like cut with knife and mispaced elswhere. Another example would be tunnel with road made of reinforced blocks but no walls improved - then bottom 25% of neigbouring blocks would also have reinforced texture "leaked" and blended with dirt. It would use kind of - to the top rule. Block below would leak it's texture to block above it. Similar how corners between wall and floor are filled with stripe of floor textured border, but without that thick edge and sharp edge. In case of blocks on the same level leaking priority of higher tier to lower tier, or opposite should be chosen. Alternatively when wall blocks of different tiers are touching there should be some pillar or straight beam placed in between them - most rooms have those on wall corners and also edges of floor. Again with priority of one tier over another, because placing two egdes at once would produce unpleasant ovelaping effect. And by the way, as Sebt mentioned the look of walls that resemble clean, human castle walls. I think that a little color adjustment could do the trick - try to reduce ammount of blue and bring a bit more red. Even on stone picture posted above its more into warmer light brown instead of bluish gray. There could be also some global colored noisemap as a color overlay that would break the singletone color uniformity. Alternatively simple gradient color overlay from top to bottom layer that would make subtle transistion between cold gray to brownish stone at the bottom. No need to make changes to the model. I think that combining the roads and walls could be a bit tricky, but it would be interesting to be able to do both at the same time and just upgrade the tile space instead of the wall and floor separately. The problem I see tho with this is what if you want really good roads to improve your speed of production, but you don't have the resource to improve both wall and floor? Right now for testing purposes it won't cost resource, but eventually it will or should I must say and that could make expansion bothersome. Can you make the road stairs rotateable? Right now the direction the stairs choose aren't based on the "direction" of the road, but on which neighboring blocks are at the same level and which not. There is a little short of room to make twists like that and make it realistic. Then it is even harder when making it realistic when three roads are connected in a downwards spiral as well. I will take a look at it, but if it starts looking messy I will probably let it be like it is here. In many games when single tile meets another single tile they make sort of connection between them, for example one tile of road is surrounded by grass, but when another came to meet that single tile of grass they bond with themselves with a road path and from the side of connection there's no grass anymore, but road path. So analogical those stairs above could change into twisted stairs in direction of the stairs below. Twisted reaction. I think that could work perfectly with every possible connections, especially may be helpful in making connections in hydraulics constructions. (24-06-2015, 07:36 PM)Sebt Wrote: In many games when single tile meets another single tile they make sort of connection between them, for example one tile of road is surrounded by grass, but when another came to meet that single tile of grass they bond with themselves with a road path and from the side of connection there's no grass anymore, but road path. In MineCraft, if you want rails to spiral down, you need to do it on a 3x3 area, much as it currently is with roads in this game currently. However, their steps do handle quick turns, I believe, depending on what other steps are nearby. I can't say I hate having to make wider turns, though. As they are right now, stairs are subdivided in a 4x4x4 grid of smaller blocks. Old stone stairs where 5x5x5 I think? Either way, it's impossible to do a curved stair on that space, with blocks, as it is right now. Believe me, I tried every possible way using a highly advanced voxel simulator (a.k.a. Minecraft) and every-and-all combinations look impractically awful. We either abandon the blocky theme and do some curved stairs, or we stick with it and use ladders for close quarter vertical navigation. Current time: 23-04-2019, 08:33 PM Powered By MyBB, © 2002-2019 MyBB Group.